$35 for Students, $50 for ELGL members, and $90 for non-members (includes ELGL membership). #ELGLPopUp conferences are multiple conferences, held on the same day, in multiple cities. This year's theme is Choose Your Own Local Gov Adventure which is reflected in the agenda for each location. Each location will have a diverse agenda focusing on everything from policing, to elected service, to libraries and everything in between. #ELGLPopUps allow ELGL members to choose a conference location that is convenient for their travel and budget, while still uniting our members in a conference experience across the country. 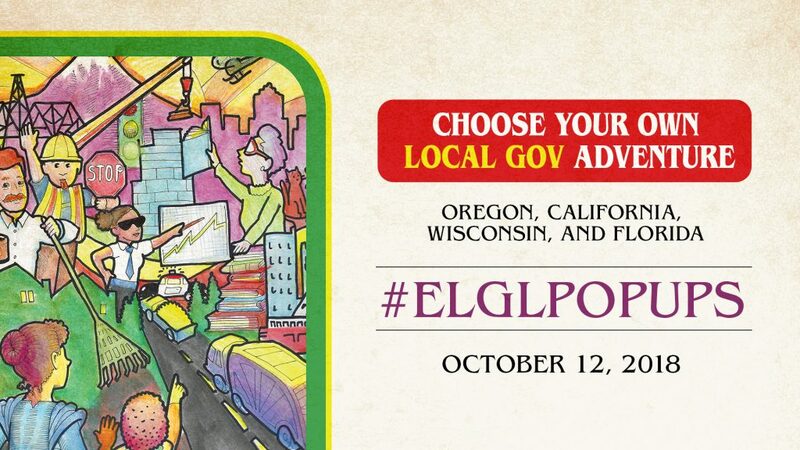 The unique format of #ELGLPopUps means that ELGL members are conferencing nationwide on the same day. No matter which location you pick - you'll feel connected to a nationwide network when you participate in an #ELGLPopUp. #ELGLPopUps plan the local government conference they've always wanted to go to, but haven't yet encountered. You'll find sessions that are practical and helpful, lunches that are actually edible (no chicken and rice banquets at ELGL events), and plenty of opportunities to build your professional resume through sessions, add-on events like professional headshot photos and resume review, and authentic networking. Our #ELGLPopUps sponsors keep our ticket prices low so you can experience a high quality one day conference! Please join us in saying "thank you" to these amazing event sponsors.